I came across another interesting headstone while looking through the Longuenesse cemeteries file. This one belongs to Lance Cpl. C R Noble, V.C. who served in the Rifle Brigade as service number 3697. The Lance Cpl. Noble’s headstone stands shoulder to shoulder with its neighbours, but who was C R Noble in the early 1900’s. Let’s start at the beginning so to speak. Cecil Reginald Noble was born on the 4th of June 1891 Bournmouth the son of Frederick Leopold and Hannah. Frederick in the census of 1901 told the enumerator that he was 35 years old, born in Yeovil, Somerset and that he was a painter and decorator, His wife aged 36 had been born in Sussex. Frederick also told that he had two children, Florence aged 11 and Cecil aged 9. Home for the family of four was 36 Lincoln Street, Bournmouth (which is about a 25-minute walk to the beach). Ten years later in 1911, Frederick and Hannah were living at 335 Holdenhirst Road, Bournmouth. The couple had been married for 23 years and the census tells that Hannah had given birth to four children but at the time of the census two of her children had died. The couple had a boarder in their seven-roomed house – Bertha Tilley, a 29-year-old single lady who worked as a machinists bookkeeper. We know from the subject of this blog that Cecil was not one of those two children who had died before the census. Cecil however, seems to be lost in the census. I have tried using all permutations of his name; not including his name and being so vague in the search that there are millions to look through. He must be there somewhere, maybe someone out there knows where he was! He may not be able to be found in the census but the availability of his service record certainly makes up for that. Cecil’s service records come to over 20 sheets of forms and letters of which some are slightly damaged and faded. The first sheet of his Short Service record includes much of the information already known – his address, his occupation and age (19 years 10 months) and his regiment, service number and rank. What was not previously known was that Cecil had served for a short time in the 6th Hampshire Batallion. A note written under his service in the Hampshire’s says ‘not being able to attend’. He signed the form which was witnessed by Sgt Weaver. It is the second page that clarifies his service with the Hampshire. He served ‘at home’ for 1 year and 224 days – from the 31st of March 1910 to 9th November 1911. 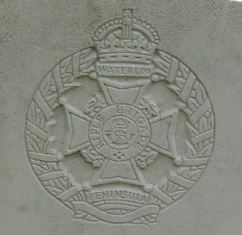 Further dates confirm he was in service from October 1914, being part of the B.E.F. from November 1914 until the 13th of March 1915, a date his family would always remember. The second page of his records gives information regarding his service medals, that he was wounded and that he had been granted the Victoria Cross, Gazetted 28th April 1915. The final information tells of his next of kin – I was expecting Frederick and Hannah but the record gives his next of kin as Alexander and Hannah of 335 Holdenhurst Road, Bournmouth. Who is Alexander as I’ve not found a connection to a Hannah and Alexander in the area? Would you recognise Cecil if he walked down the street? Let’s see! He was a young man, a few months from reaching his second decade. He was 5′ 8″ in height, weighing 139 lbs (just under 9 ¾ stones and a 38″ fully expanded chest. He had a fresh complexion with brown hair and eyes. He had been brought up in the Church of England. His vision was good and he had a scar beneath his lower lip and two vaccination marks (done in infancy). You might have to look close for the scar but I think he would be recognisable, don’t you? Anyway, he was classed as fit on the 31st of March 1910 in Winchester. He must have been in Ireland at some time as on the 29th of August 1911 he was given an antityphoid inoculation with a second injection following on the 9th of September. He had another inoculation in May of 1917. A further page confirms his service in Dublin, with further service in Colchester. While serving in Dublin on the 24th of February 1911 Cecil was charged with ‘using obscene language to a NCO’. 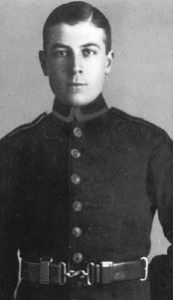 Acting Corporal Milner was named as a witness. Cecil was appointed Pioneer in September 1913 and by the 23rd of November 1914, he had been appointed Acting Corporal. From now on his service records give information and events that occurred after his death. Hannah had lost her son in March 1915 and the following year in the March ¼ her husband had died. A letter to Mr F Noble was received at 172 Capstone Road, Bournmouth you can only imagine how Hannah would have felt, receiving a letter from the Rifle Records Office addressed to her husband who had recently died. The letter would have been included in a small package that contained the effects of her son, Cecil Noble, V.C., and contained:- a leather wallet containing letters and photographs and a ‘Green Jackets Lodge of Oddfellows’ contribution book. Hannah wrote:- ‘Articles herein mentioned received with thanks, Hannah Noble’. By 1919 when most of the paperwork seems to have stopped Hannah and her daughter, Florence Gertrude was still living at 172 Capstone Road. In June 1915 £12 3s 4d was sent to the family with a second amount of £5 War Gratuity following in 1919. Hannah had to confirm receipts of medals, the plaque (death penny) and scroll. There was one final signing to be performed and that was on the 14th of June 1921 when she signed to acknowledge receipt of the Victory Medal – some six years after her son died of his wounds. As Cecil had been awarded The Victoria Cross he was immortalised on two sets of cigarette cards – one ‘Glory Boys’ by Martins and ‘Victoria Cross Heroes’ by Cohen-Weenen. Wikipedia has a page for Cecil complete with a picture of him wearing his Victoria Cross. 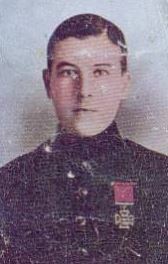 This image does not seem to ring true as the deed for which The Victoria Cross was awarded took place the day before his death – being wounded he would have been in some form of hospital and not looking as ‘spick and span’ as he is on the photograph – is there some form of doctoring going on with the photograph? This entry was posted in General on March 30, 2018 by carol.